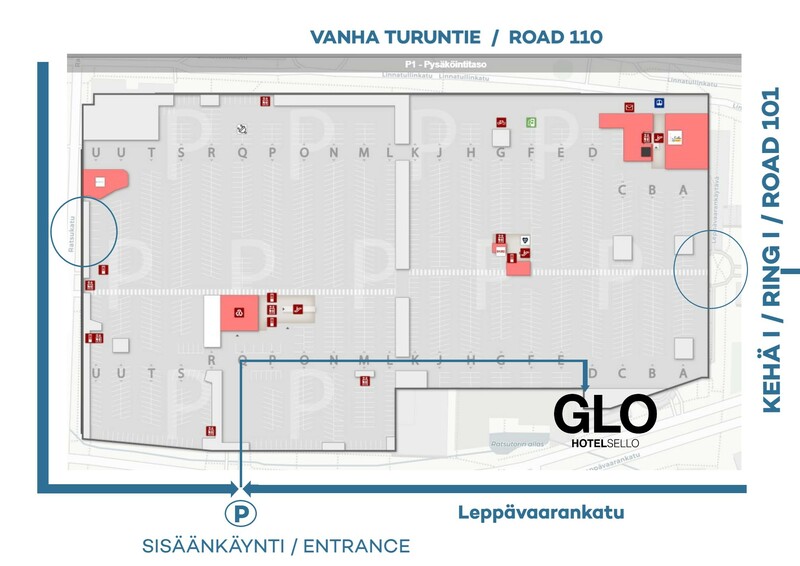 There's a complimentary parking in the Sello shopping centre's parking halls (24h drive-in access from Leppävaarankatu, see picture below). You can find the hotel entrance at the D and E point. Our guests can park at any empty space, but the car's windshield must have the parking permit from the hotel reception. GLO Hotel Espoo Sello is situated at the following address: Leppävaarankatu 1, 02600 Espoo. The hotel is located at the intersection of Turuntie and Ring I / Road 101, connected to the Sello shopping center. Ring I / Road 101, approaching from the East (from the airport): After the Turuntie junction, choose the right lane and follow the signs for Etelä-Leppävaara. Ring I / Road 101, approaching from the West: take the right side lane and follow the signs for Etelä-Leppävaara. Using Helsinki public transportation is an inexpensive and quick way to transfer around Greater Helsinki area. Leppävaara train station is just around the corner of GLO Hotel Sello. You can check timetables below. VR railway transportation between Helsinki and Turku have a station in Leppävaara right next to shopping mall Sello. GLO Hotel Sello is only a short walk away from the station. Messukeskus & Hartwall Arena are only minutes away from GLO Hotel Sello. Fastest trains take only 7 minutes to travel.